Old Abbey of St. Remacle, Stavelot. 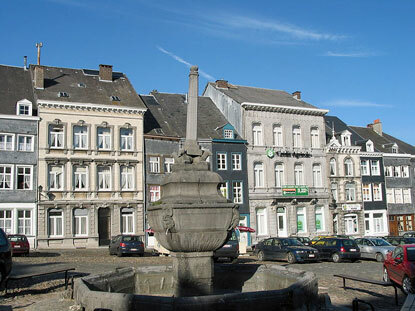 Stavelot, like nearby Malmedy is at the same time of one Belgium's oldest and newest towns. One of the oldest because its foundation dates back to 647, and one of the newest because it was not part of Belgium until 1920, when it was ceded by Germany as war reparation for WWI. Stavelot was the 'capital' of the Principalty of Stavelot-Malmedy, a small independent region of the Holy Roman Empire whose rulers were the abbots of Stavelot. The principality was dissolved in 1794 during the French Revolution and Stavelot passed to Prussia in 1815 (see Malmedy). Like Malmedy, Stavelot is renowed for its carnival, known here as the Carnaval de la Laetare des Blancs-Moussis. On the fourth Sunday of Lent, some 200 local white-clad men (the Blancs-Moussis) wearing masks with long red noses parade through town dancing, hopping, grunting, throwing confetti and beating up bystanders with dried pig bladders (among others). 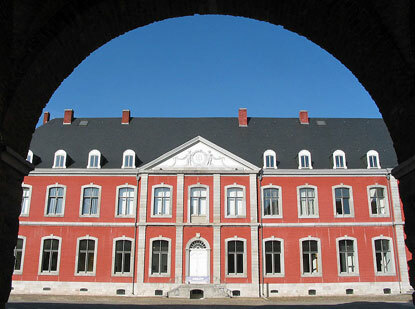 The rest of the year, the main reason to visit Stavelot is for its abbey. The Abbey of Stavelot (open Tue-Sun, 10am-6pm) was founded in the 7th century by Saintt Remacle and was the seat of the principality for over 1000 years. The abbey houses three museums : The Historical Museum of the Principality of Stavelot-Malmedy, the Guillaume Apollinaire Museum (the famous poet stayed for some time in Stavelot), and for something completely different but still local, the Spa-Francorchamps Racetrack Museum. The nearest train station is in Trois-Ponts. Buses make the connection to Stavelot every hour (10min). If you are coming by car, Stavelot is near the E421 (Verviers-Prüm) motorway, exit 11.